Your brakes are one of the most important components within your car when it comes to safety. Keeping them in good working condition is also less expensive than most repairs. Proper maintenance isn’t difficult and is important to not only your safety but others. If you are unsure of the last time you had your brakes serviced drop by our shop and one of our brake repair specialists inspect your brake system and pads; we will get you back on track. Having your brakes checked regularly cannot only help reduce the risk of costly repairs but ensure your safety. Coopers Auto Repair Specialists of Tacoma, WA provides accurate and dependable brake repair and service. We want to be your dealership alternative for brake maintenance and repair and recommend having them inspected every 12,000 miles or once a year. A good habit to get into is having them inspected when you get your oil changed. With a great reputation throughout the Tacoma and Puyallup area for being fair, honest, and cost effective, there is no reason you shouldn’t bring your vehicle to Coopers. Your brake system has warning signals that help make you aware of problems that need to be inspected. These warnings are capable of being felt and/or heard. The most common warning signal is a high-pitched squealing noise. A small metal wear indicator within your brake pads causes this warning sign and alerts you that your brake pads are wearing thin. If you play music loud or use your air conditioner often, you may miss this audible warning sign. The second most common problem is your vehicle shaking when you brake. This can be a sign that you either have warped rotors or possibly need new tires. The vibrations can often be felt in the pedal as well. Another signal is unresponsive or spongy brakes. If you do not know how this feels, you will when it happens. Your brakes will not respond normally and you may have to depress the brake harder and further down than usual. This can be caused by a lack of brake fluid or air in the brake line. Finally, the last warning sign is a loud grinding noise when braking. This happens when your brake pads are completely worn and only metal is left. This can also cause damage to your rotors, which are expensive to replace. If you run across any of these problems please have one our brake repair specialist inspect and repair your vehicle soon. Why Choose Coopers for Brake Repair and Maintenance? Coopers is dedicated to providing Tacoma with the best brake service and maintenance in the area. Our customers come in clients and leave as friends. We go above and beyond every day for our customers and it shows in our online reviews. Not only do we focus on quality workmanship, but also exceptional customer service. If you are not happy, we are not happy either. We take the time to explain everything and answer any questions that may come up. 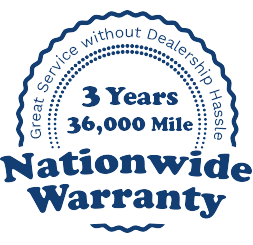 We are so confident in our work that we back our services with an industry leading 36-month / 36,000-mile warranty. So call or schedule service online and see why we should be your dealership alternative for brake repair in Tacoma and brake repair in Puyallup.